The debate for the top pick in upcoming fantasy baseball drafts has usually been between 2012 AL Rookie of the Year Mike Trout, and reigning AL MVP and Triple Crown winner Miguel Cabrera. But there is a hitter that resides in Milwaukee that has something to say about that. Ryan Braun had another terrific year last year, finishing in the top 5 in every offensive category. He recorded his fourth straight 100+ run season, fifth straight 100+ RBI season and the most underrated part of his game is his stolen bases, which he recorded his second consecutive 30+ steal season. Durability is essential in every sport, but baseball’s 162 game grind can have players missing more than a couple games. The former MVP has played in 150+ games each of the past five seasons. On top of that, he had his first career 40+ home run season and has blasted at least 25 home runs in each of his six big league seasons. 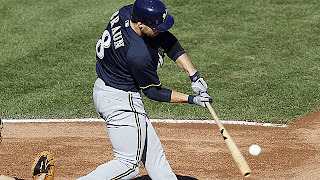 Braun has won the Silver Slugger award the past five seasons and there are no signs he is ready to slow down. Some people last year had doubts of picking Braun, after last off season he supposedly tested positive, but he won his appeal and had a huge year to shut the mouths of all the haters. If you have the number one overall pick in your league, you want someone who will produce in copious amounts, this man is your guy. The Milwaukee left fielder is poised for another monster season and if you do get the privilege to have him on your team you should feel like one of the lucky ones. I wrote a similar article praising cano as #1 overall, but it wasn't published. If you have time give it a read. As the fantasy baseball season approaches, there is one big question that every fantasy owner needs to answer. Who, if the owner had the first pick in the draft, would be chosen? Most years, there are two main candidates for this honor. Last year it was a battle between Miguel Cabrera and Albert Pujols (Cabrera being the more popular choice). This year, in the minds of many, it is once again a two-player race. The two most popular choices for first overall are Mike Trout, and Miguel Cabrera. Some experts also rank Braun first overall, but generally it’s Trout or Cabrera. Trout rocked the fantasy world last year, and Cabrera rocked the real world, winning the Triple Crown and MVP. However in my mind, there is a fourth choice. Let’s play the game of Player A and Player B (and C). The list goes on. Most of these guys (I’ll exclude Hanley, not a fan), are much closer to Cabrera’s/Trout’s numbers than the other second basemen are to Cano’s. You cannot find Cano’s numbers compared to position depth anywhere else. He has ten more homers than anyone else at his position. At 1B you can draft Ike Davis in the 9th/10th round, get what I expect to be a line of .250-.270/25-35/80-100. Compared to Cabrera, this is not amazing, but will fill the hole well. At 3B it is less deep, and it is understandable to draft Cabrera for this reason. But 2B is by far the shallowest position in baseball. Furthermore, no matter how stable Cabrera looks, I don’t know when his stats will start to deteriorate, considering his past problems with drinking. In the OF, you have the deepest or second deepest position in the sport. You can find a very good substitute for Trout easily in the later rounds. The main concern with taking Cano is the lack of steals. But once again, steals are not hard to find in later rounds. Michael Bourn due to the long wait may be a steal this year. You can even pick up speedy guys as they get hot during the season. Honestly, don’t worry about stolen bases, they can be found elsewhere. In the end, it is a matter of preference, but if I have pick #1 on draft day, Cano will be my man.